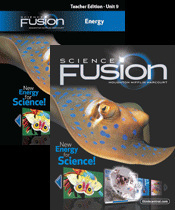 Science Fusion is a comprehensive, digitally-focused curriculum that provides all the tools to engage students in exciting, inquiry-based learning at every point of instruction. It provides deep science content and lessons, activities and Video-Based Projects that incorporate and develop 21st Century Skills. Student Edition print materials promote active learning of state standards.